If there are any stories or photos you want posted on the site regarding the band, e-mail me below and I'll see what I can do. 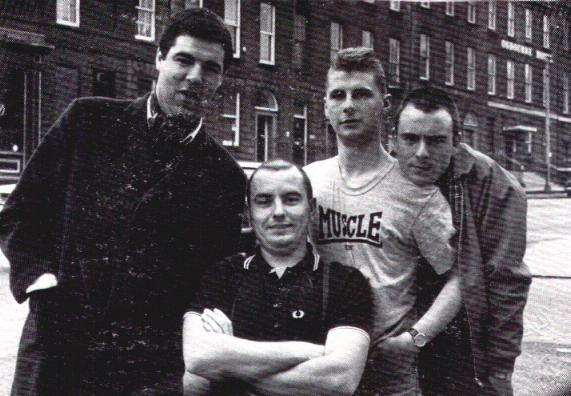 In London, by 76/77 there were only a few skins left, people like Terry Madden from Camden and Binnsy from Arsenal. I was a punk in 76 and in late 77, I bumped into a bloke in full skin regalia, sta-prest, Ben Sherman, Crombie and Loafers! A bit of a shock to the system, the last proper skins I remembered , at the age of 10-11 being my Uncles and cousins - 69/70 smart. I was already into the Jam (remember 'Jam' shoes down Shelleys?) from the Red Cow through to supporting the Clash at the Rainbow. The fights down the Kings Road were Punk vs Ted (with similar small scale fights all over like those at Liverpool Street and Petticoat and the second wave skins hated Teds,) have a look on the cover of Clash City Rockers (I'm there with someones ear across my face...suppose it stopped the camera from breaking). The decison was simple, move away from something I'd enjoyed to being different and sharper. At first being a skin was class, everyone who got into it went looking for the right gear, visiting every old tailor and army surplus etc hoping to get Ben Shermans (in the 'wooden' boxes') Sta-Prest. To my and my mates in Hoxton, we preferred loafers and brogues rather than boots, look smarter and just as hard. Hair was a No.2 with the classic razor parting. I raided my uncles old rooms for records and original Shermans....Tighten Up Volume 2....and Tamla and Stax. It sounds elitist, but as it became more popular, then it started to go downhill for many of us. As mohicans and begging did for punk (no one was a mohican in 76/77), the glue sniffers and idiots did for skin, for mod it seemed that Poison Ivy etc and mail order (just wear a parka, be a mod) started to do it for mod....sounds snobby I know! The last big event I can recall was the August Bank Holiday at Southend in 1979, where skins, mods, suedeheads, punks, teds etc all seemed to fight with each other (See Garry Bushells original Sounds article and Kims article in Maximum Speed). The mob I was with were based around West Ham and were after the Teds and Skins (they looked a disgrace to us...read the fanzine Hard as Nails for some excellent piss takes as Harry and his Skinhead girl (typical glue sniffing idiots)get transported back in time to 69....as a mob of 69 sharp skins are transported to 79). That night we went to the Paddocks on Canvey Island to watch Secret Affair.